It’s time to kick back, relax and enjoy our educational journey through Virginia’s beautiful wine & cider country. That’s right, we are adding cider to our tour today with a stop in Dugspur Virginia with Diane Flynt, owner of Foggy Ridge Cider. Dugpsur is nestled in the Blue Ridge Plateau – roughly a three hour drive southwest of Charlottesville. It’s in this orchard oasis that you will find Diane Flynt making world-class ciders more in the tradition of fine wine. 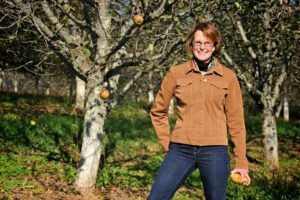 She is a recipient of two James Beard nominations and was recently named as a revolutionary in the Virginia drinks business by Wine Enthusiast. 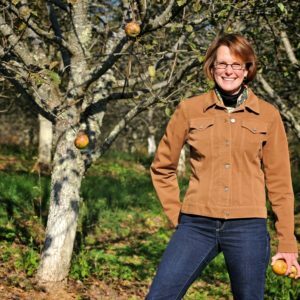 In addition to producing exceptional cider, Diane is also a member of the Virginia Wine Board. On the program, we are discussing the history and evolution of the cider industry. Plus, Diane reveals her secrets to making cider in the fine wine tradition. She will also share some of her favorite savory dishes that pair best with her cider offerings. Foggy Ridge Cider’s tasting room is located at 1328 Pine View Road, Dugspur, VA and is open on the weekends from April-December. Why not make a weekend out of it? Foggy Ridge has a lovely cottage on property that’s available to rent through VRBO.com.